Adesina, who is special adviser on media and publicity disclosed this on Twitter Friday afternoon and taunted the President’s critics, who have been wailing over his certificate. 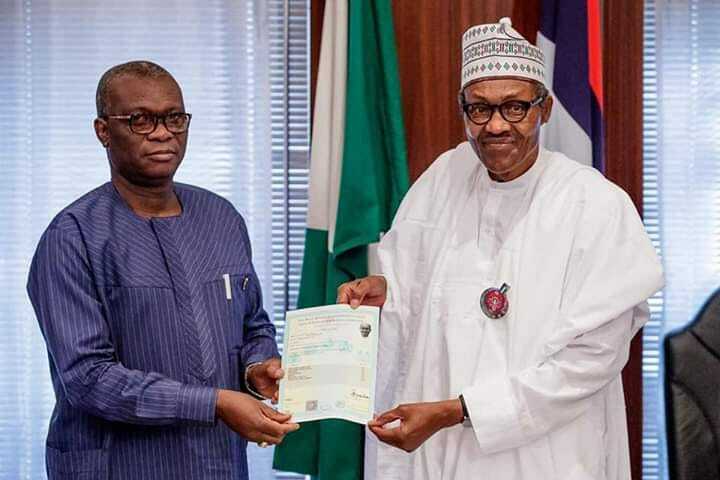 Like in 2014, there was a renewed controversy over the school certificate of President Buhari in recent weeks, following the publication of his credentials for the February 2019 election. According to INEC, the president said his school certificate result and other academic credentials were with the Nigerian military, which he served from 1961-1985, retiring as head of state and commander-in-chief of the armed forces. The main opposition Peoples Democratic Party (PDP) on Oct. 26 challenged Buhari to show proof of his integrity by presenting his academic credentials “if he has any,” to the INEC. One critic even went to court to challenge him to produce the certificate, a move that was needless, considering that the president since 1961 after he finished his secondary education, had attained further education, leading to a Masters Degree in Strategic Studies at US War College. Buhari was born on 17 December 1942 in Daura and began attending Central Primary School in the town at the age of six. He spent three years in the primary school, from where he went to to Katsina Middle School. Following the abolition of the middle school system, he became one of the first students to be admitted to Kankia Primary School in 1954; he graduated in 1955. In 1956 he proceeded to the Katsina Provincial Secondary School. There he became a School Monitor in Class II; a school prefect; a House Captain; and ultimately Head Boy of the school. He was also at different times, a long distance runner (800 metres); a debater for his house; a player in the school’s hockey team, and the head of his unit in the school’s military cadet. He graduated in 1961 and joined the army immediately. In those days, the military recruited from the secondary schools and he and his peers were so attracted to the army. In the army, the president also had further education. He attended the Nigerian Military Training College (NMTC) in 1962. From 1962 to 1963, Buhari underwent officer cadet training at Mons Officer Cadet School in Aldershot in England. In January 1963, at age 20, he was commissioned a second lieutenant and appointed Platoon Commander of the Second Infantry Battalion in Abeokuta, Nigeria. From November 1963 to January 1964, Buhari attended the Platoon Commanders’ Course at the Nigerian Military Training College, Kaduna. In 1964, he attended the Mechanical Transport Officer’s Course at the Army Mechanical Transport School in Borden, United Kingdom. He also attended the Defence Services Staff College, Wellington, India, in 1973 and capped it with a masters degree at the US Army War College. This was between 1979 to 1980, when he was a colonel. At the war college, he gained a Masters Degree in Strategic Studies.